This update file is only available for PES 2013 was integrated PESEdit.com 2013 Patch 6.0 (the lastest version of PESEdit.com 2013 Patch). It contains new current ability of all players, new squad, starting XI and kits of most famous football teams in the world. NATIONAL TEAMS: - Europe: Belgium, England, France, Germany, Italy, Netherlands, Portugal, Spain, Turkey, Wales. - South America: Argentina, Brazil, Chile, Colombia, Uruguay. CLUBS: - Spanish La Liga: ALL TEAMS (add new team: Deportivo Alaves, CD Leganes) - English Premier League: ALL TEAMS (update new crest for Manchester City) - German Bundesliga: ALL TEAMS (add new team: RB Leipzig) - Italian Serie A: ALL TEAMS - French Ligue 1: ALL TEAMS (add new team: FC Metz) - Portuguese Primeira Liga: SL Benfica, FC Porto, Sporting Lisbon. - Russian Premier League: CSKA Moscow, Spartak Moscow, Zenit St. Petersburg. - Dutch Eredivisie: Ajax Amsterdam, Feyenoord Rotterdam, PSV Eindhoven. - Turkish Super League: Galasataray, Fenerbahce, Besiktas. - Other European clubs: Olympiacos, Panathinakos, Dynamo Kyiv, Club Brugge, FC Basel, Celtic FC. - Update 2016-17 league structure for these league: La Liga, Premier League, Bundesliga, Serie A, Ligue 1. - Update new logo and new name for these league: La Liga Santander, Premier League, Serie A TIM, Ligue 1, Liga NOS, World Cup (2018), EURO (2016), Copa America (Centenario 2016), Asian Cup (2015), CAF (2015). - Update starting year in ML/BAL is 2016, team qualifying in 2016-17 Champions League, 2016 UEFA Super Cup match beetween Real Madrid and Sevilla. - Update faces and callnames for many players. - Update full balls for 2016-17 season. You can choose one in five 2nd divisions to play: Sky Bet Championship, 2. Bundesliga, Liga Adelante, Serie bwin, and Ligue 2. - Open folder "2016-17 2nd Divisions" in download file, choose one file with the name same as 2nd divison you just chosen, run file and choose the folder where you installed PES 2013. - Transfers information from Transfermarkt. - Players ability from PES Stats Database. - PES 2013 Editor v2.0 by w!Ld@. 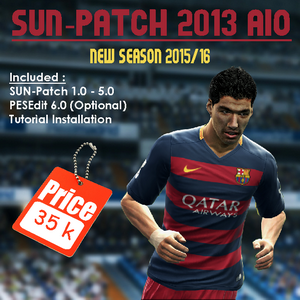 - PES 2013 Ultimate Editor v5.4.1 by barcafan. - PES Ultimate Data Explorer v2.9.7 by barcafan. - PES 2013 Callname Pack by Nedz. - PES 2013 Commentaries Map v4.0 by Omar Ahmed. - PES 2013 Starting Year Tool 2.0 by zaga14. - PS3 Pad for PES 2013 Full game by congdien91. - PES 2013 Ballpack Collection 2016-17 by Boris - Many faces, kits, balls and emblems made by various authors. 0 Response to "[PES 2013] PESEdit.com 2013 Patch 6.0 Update Summer Transfers 2016/2017 by bedoedeyne"